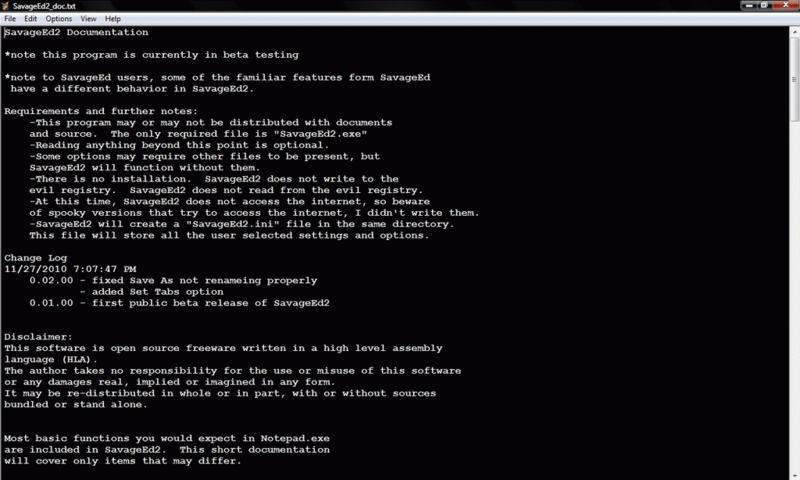 SavageEd2 is a very small and fast Notepad replacement. It can edit files of any size, limited only by memory. It can encrypt text files using AES encryption with 256 bit key (max 32 character password) in .enc format. It has Pattern searching features and written in x86 assembly language (HLA). Writes settings to: Application folder. How to extract: Download the ZIP package and extract to a folder of your choice. Launch SavageEd2.exe. SavageEd2 is currently in beta testing. [*]Does not use Windows registry, creates a local configuration file. [*]Improved find/replace dialog -quick find: double click to highlight word, Find Next (F3) to find next instance. [*]Auto save and quick ESC exit. [*]Dual direction LOG files (append updates to 'end of file' or 'top of file'. The software Author has stated that the original SavageEd will not be developed, but that SavageEd2 will.